And USA cross the finish line to provisionally win Race 1 of the 33rd America's Cup. Delight for the American team and certain vindication in these conditions for the concept of the solid wing sail and the trimaran platform. Race press conference in 2 1/2 hours - watch it live! BMW ORACLE Racing wins Race One of 33rd America’s Cup. Valencia (February 12, 2010) – BMW ORACLE Racing has started the 33rd America’s Cup Match with a convincing victory over the defender, Alinghi. After both boats entered the start box, skipper James Spithill (AUS) was able to speed deep into the box on starboard tack, preventing Alinghi 5 – the give way boat –from crossing ahead. 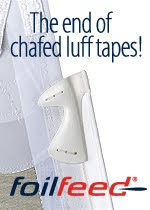 As the boats dialled-up into the wind, the Umpires judged Alinghi hadn’t done enough to keep clear and penalised the Swiss team. 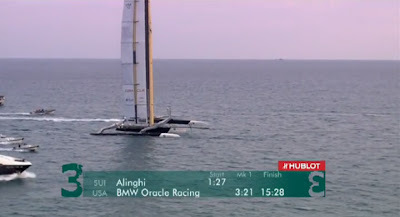 Alinghi, however, made a good recovery. With both teams to windward of the start line, the Swiss made a quick return to start ahead. In fact, by the time USA crossed the starting line, it was over 600-meters behind A5. But then USA started to simply outpace A5 by sailing higher (closer to the wind) and slightly faster. The 600-meter deficit was soon erased, and USA went on to lead by 3:21 around the top mark. 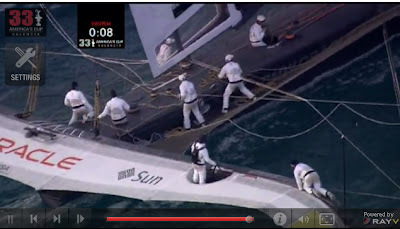 The final delta at the finish, after Alinghi completed its penalty turn, and finished correctly, was 15:28. Reaction from the sailors on USA will follow once the boat returns to port.
. You can see great images of the team at www.bmor-photo.com.